You are now ready to start wedging your 3-Curve Scoliosis. You’ve done your homework. You started with your Daily Scoliosis Stretch, you defined your curve with our curve-defining videos and you found that you have a 3-Curve Scoliosis. Now it’s time to put that information to work. It’s time to start moving your spine towards neutral. If you have a C-curve scoliosis, you are on the wrong page. Exit immediately! 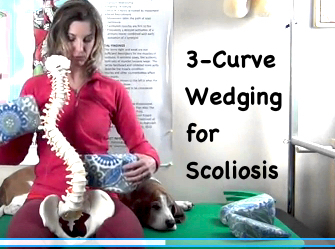 When you have a 3-Curve Scoliosis, the guidelines in this video will help you know where to wedge your spine so that we can begin to bring your spine towards a more neutral shape. Why do you we want to move towards neutral? Because even a slight shift towards longer and straighter allows us the opportunity to then add strengthening exercises (see our next video) so that we can begin to hold your new spine shape. A little shift towards center, a little bit of strengthening and a giant step down the path of exercising and feeling better with scoliosis. So, you say you don’t have any Scolio-Wedges yet? But in the meantime use towels, shoes, good intentions and puppy dog rumps that have come to snuggle next to you. Whatever you use as a wedge, you can make this happen!